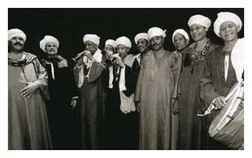 The Musicians Of The Nile (English) or Les Musiciens Du Nil (French) is the name under which the famous Upper-Egyptian folk musician Metqāl Quenāwī Metqāl and his troupe was marketed in the west. Metqāl plays southern Egyptian folk music locally known as Ṣaʿīdī (Upper-Egyptian) with the Rababa as its main instrument. For marketing purposes this music was in the West sometimes classified as gypsy music.